Double X has a disturbing profile today of the men's rights movement and its involvement in belittling domestic violence against women. 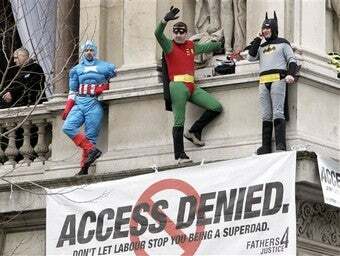 According to writer Kathryn Joyce, men's rights groups (like the one whose members climbed Buckingham Palace dressed as superheroes to protest custody laws) see domestic violence laws as discrimination on a par with racism. They contend "that false allegations are rampant, that a feminist-run court system fraudulently separates innocent fathers from children, that battered women's shelters are running a racket that funnels federal dollars to feminists, that domestic-violence laws give cover to cagey mail-order brides seeking Green Cards, and finally, that men are victims of an unrecognized epidemic of violence at the hands of abusive wives." A statement from RADAR (Respecting Accuracy in Domestic Abuse Reporting) reads, "It's now reached the point that domestic violence laws represent the largest roll-back in Americans' civil rights since the Jim Crow era!" This is obviously an exaggeration, but, as Joyce also points out, claims that domestic violence law is discriminatory have gained some mainstream acceptance. RADAR board member Ron Grignal says, "I've had Democrats on Capitol Hill tell me they agree with everything I say," and Joyce writes that an LA conference on male victims of domestic violence "received positive mainstream press for its 'inclusive' efforts." So are men's rights groups on to something? Is domestic violence law marginalizing men? [C]ritics like Australian sociologist Michael Flood say that men's rights movements reflect the tactics of domestic abusers themselves, minimizing existing violence, calling it mutual, and discrediting victims. MRA groups downplay national abuse rates, just as abusers downplay their personal battery; they wage campaigns dismissing most allegations as false, as abusers claim partners are lying about being hit; and they depict the violence as mutual-part of an epidemic of wife-on-husband abuse-as individual batterers rationalize their behavior by saying that the violence was reciprocal. Additionally, MRA groups' predictions of future violence by fed-up men wronged by the family-law system seem an obvious additional correlation, with the threat of violence seemingly intended to intimidate a community, like a fearful spouse, into compliance. It's upsetting but perhaps not surprising that the men's rights movement's tactics mimic those of abusers, given that the movement itself sets up such an adversarial relationship between men and women. The sad thing about this is that, in a very real way, women's rights are men's rights. Being a feminist or an advocate for domestic violence victims doesn't mean you want women to be allowed to batter men. It means you believe in egalitarian relationships in which partners resolve disputes through communication rather than violence — something that benefits both men and women. Men's rights groups also often focus on father's rights — the right to custody of children after a divorce, for instance. But feminists work for fathers' rights too, arguing that women aren't the only "natural" caregivers and that men can and should play an equal role in raising their children. We're just not in favor of giving custody to abusive fathers — and some high-profile members of the father's rights movement have been accused of abuse. The men's rights movement includes some pretty scary people — according to Joyce, some even defended Pittsburgh gym gunman George Sodini — but it no doubt also includes some decent men who believe the old lie that feminists are out to get them. In fact, we support their right to healthy relationships, and to be treated as equal partners in their families — we just don't think they have a right to beat us up.